It's 10:45pm on July 10, 2018 and the stage is set at Yakatoot Rahimabad for ANP leader Haroon Bilour to address a corner meeting. A black SUV arrives. He’s here, dressed in a light shalwar kameez and the red hat that is the party symbol. Haroon is here to campaign for his party, something they were not allowed to do in the last elections after terrorists targeted them for their leftist narrative. His father, Bashir Ahmed Bilour, was killed in December 2012. As he gets out of the vehicle, there is a bang. It is the sound of fireworks going off. Workers welcome him by shouting ‘Nr Bilour, Pashtoon Bilour, Haroon Bilour, Shaheed Bashir Bilour [Brave Bilour, Pashtun Bilour, Haroon Bilour, Shaheed Bashir Bilour]. He is smiling and mingling with the men who are eager to get close to him and take selfies, undeterred by the warnings security agencies have issued of possible attacks on party leaders. Haroon does not seem to be in a rush to get to the stage. He keeps responding to his supporters, hugging the ones who can get close to him and waving at those chanting for him from a distance. After almost four minutes, he finally reaches the street where the stage has been set up for the corner meeting. The sound system is blasting the party anthem. As he makes his way to the stage, workers get up from their seats to greet him. The sound system continues blasting the song as he takes his seat. Another loud bang is heard but this time it isn't fireworks. A camera showing Haroon goes dark followed by a brief moment of silence. Haroon is no more. He has joined his father in the ranks of those who sacrificed their lives for what they believe in. Fast forward a few hours and the mantle of the Bilour Family has been passed on to Daniyal, Haroon’s 16-year-old son. 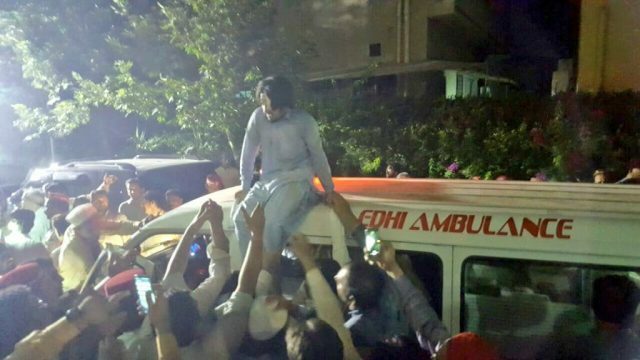 As the ambulance transporting Haroon's body makes its way through crowded streets, Daniyal is on its roof urging workers to remain calm. He shouts: “Zinda hai Bilour, zinda hai." Bilour is alive, he is alive!